Test your Stainless Steel to see if it's properly passivated. 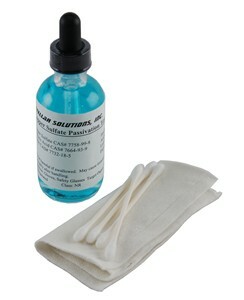 This test kit includes everything you'll need to test Stainless Steel (except 400 grades). Apply a small amount of Citrisurf® Copper Sulfate solution to your surface and let sit for at least 6 minutes. Apply additional solution as needed to keep the surface wet. Carefully rinse and air dry being careful not to disturb any copper deposits that may be present. If the tested area has a copper (pinkish) residue, the surface has not been properly passivated. Not intended for use on 400 grade Stainless Steel surfaces. 2 ounces of liquid. Instructions included.